There are nearly 200 restaurants in Bethesda, according to www.downtownbethesda.com. That’s a lot of potential. I just wish there were more restaurants that I was actually excited about. I find myself dining in Bethesda fairly often. We go before or after movies at Bethesda Row or Roundhouse Theater, and sometimes just because it is a convenient place to meet friends. But when I’m asked what are my favorite spots in Bethesda, honestly I am stumped. Don’t get me wrong. There are plenty of decent places to dine that are worth the twenty minute drive it takes us to get there. Mia’s Pizza, Green Papaya, Nest Cafe, Persimmon, Raku are all pleasant options. And, I must admit there are a number of restaurants that I haven’t been for quite some time that are worth checking out again. Jaleo, Grapeseed, Assagi Mozzarella Bar. I’ve been to the new American Tap Room and I like it just fine. I’m ready to try it again with my Capitol Dish coupon. I have to admit though, that I was much more energized by the light-up menu and bill, than I was by the food. But for what it is and where it is, it’s a really good option. I am excited about a number of new places in Bethesda that I have yet to try: Food Wine & Co., Uptown Deli, Taylor Gourmet, Yamas Mediterranean Grill. I am skipping Mussel Bar. I don’t like mussels. I don’t like beer. I don’t like noise. I recently needed to plan a dinner in Bethesda with a group of ten. I find myself under added pressure these days. People actually think that I know what I’m talking about when it comes time to choose a dining destination. I wanted to know if I was missing something, so I decided to seek some help by posting a message on www.donrockwell.com. If you’re not familiar with Don Rockwell, there was a fascinating article about him recently in The Washington Post. My request for suggestions on a Bethesda spot suitable for ten on a Saturday night came back with the following recommendations: Redwood, Grapeseed, Passage to India, Cesco, Jaleo, Mon Abi Gai, Guapos (? ), and Guardado’s. The only aha moment here was Guardado’s, a tapas restaurant referred to as “a hidden gem” in Bethesda Magazine. I’ll have to check it out. It turns out that I won’t be in town for the above-mentioned dinner for ten. 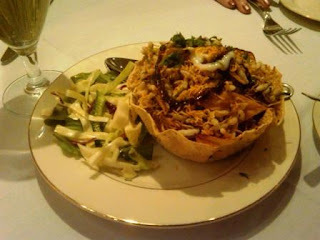 But I did want to report briefly on my recent dinner at Passage to India, since it was on the list of recommendations I received..
First of all, I haven’t met an Indian restaurant that I don’t like. Nothing is as flavorful or as interesting to me as Indian food. 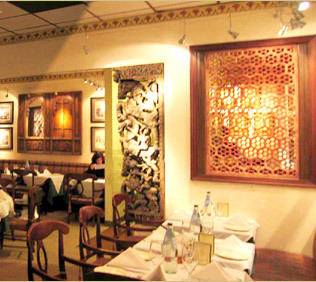 Passage to India is #83 on the Washingtonian’s 100 Very Best Restaurants. I’m a sucker for lists like these. It absolutely adds credibility to a restaurant, at least in my opinion. So I start off with a positive outlook. I like that they bring papadam to the table with three different dipping sauces. (Papadam can be compared to very thin cracker.) My favorite sauce is a sweet, tangy chutney. We order two appetizers but because of a bit of indecision on my part, I confuse the server and we end up with only one. Sev Murmura Chaat is “an exotic combination of puffed rice, cilantro, vermicelli, dates and tamarind.” I’ve had this dish at other places, and it is as tasty here as anywhere. There’s a nice combination of textures with the puffed rice, fruit and spices. We’re really fine without a second appetizer. 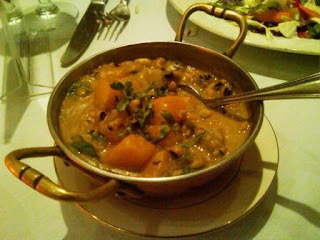 The entrees are chosen among groupings from the various regions in India.My husband orders the South Indian dish Kumbalanga Payar Olan, which is black-eye beans, white & red pumpkin in a cumin and coconut sauce. He finds it “flavorful, filling, and a fitting finish to this fine feast.” (This is my husband’s idea of a funny quote). 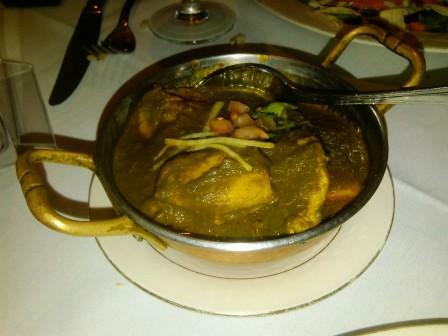 My dish is West Indian, Chutney Ni Murgi,which is chicken cooked in a spicy cilantro sauce. The chicken is tender and the sauce has just the right amount of spice. It’s a satisfying dish, if not terribly interesting or different. Onion kulcha bread is required eating when I have Indian food. Passage to India’s version is so thick it reminds me of pizza. That’s not necessarily a bad thing. It’s a generous portion, which we can’t finish. I’m happy with our dinner, and even happier that after we apply our What’s the Deal coupon, our bill comes to seventy cents. Gotta love these coupons that are proliferating every time I open my email inbox! Dining decisions can be tough. Bethesda could use an infusion of some more interesting options to make those decisions easier. In the meantime, I’ll be on the lookout for somewhere in Bethesda where the food gets my heart racing. I still have at least 140 restaurants left to try. You are making me so hungry for spicy Indian. It's time for the girls to set a date. oh boo. I didn't get a cookbook.